Tabs3 Billing Software is the industry standard for legal time and billing software and the best way to make sure you and your staff bill clients on time. 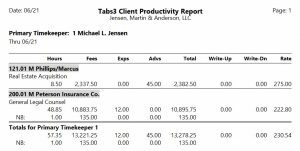 The Tabs3 Client Manager gives you a quick look into all of a client’s most important statistics and quick access to the features you use most. 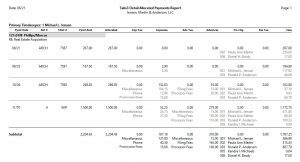 A client’s contact information, recent payments, work-in-process, accounts receivable balance, and fund account balance are neatly presented on screen. 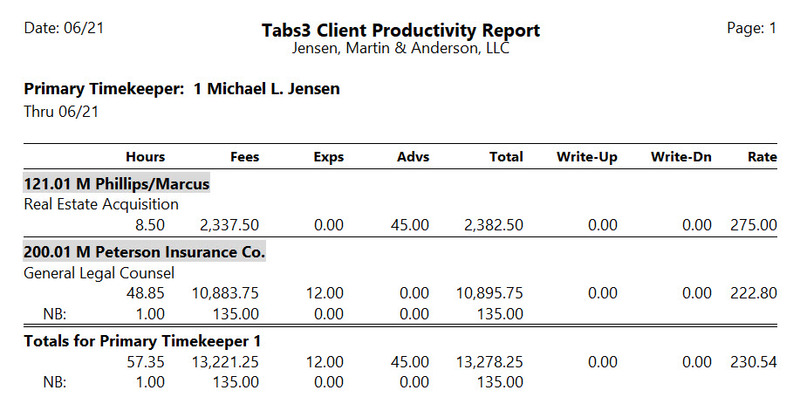 Tabs3 Client Manager also gives you customizable one-click access to the ten tasks you do most often. Restrict the ability of any user to view, enter, edit, or delete information from any client or matter. Access profiles make sure that sensitive information remains secure, and strengthen the ethical walls in your firm. Easy-to-use time entry forms help you and your staff enter time quickly. Use stopwatch timers to track time while you work, then turn time records into fees with one click. Use a client’s default billing settings or change them for non-typical fees. 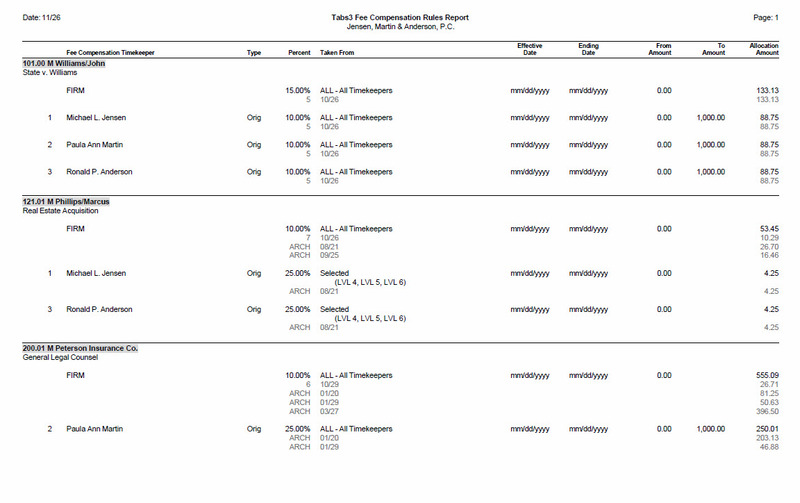 Track both Hours Worked and Hours to Bill for the most accurate reporting. Show a fee entry list to see what you have already entered. 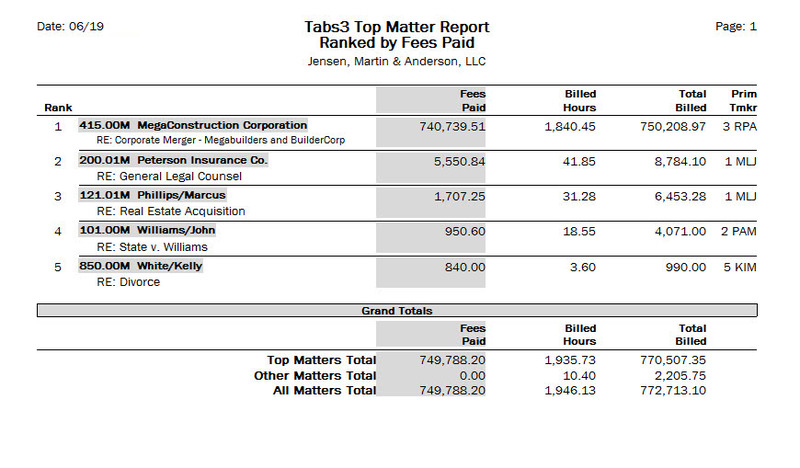 When you use Tabs3 in your law office, you have nearly unlimited billing rate flexibility. Every lawyer or paralegal whose time is billed to clients can set up default billing rates for new clients. You can also use a standard rate for timekeepers’ levels (partner, associate, etc.) or create customized rate tables for any client matter. For matters with multiple payees, split billing allows you to bill multiple people a percentage of fees and/or costs for one matter. Besides flexible hourly billing, other billing options include contingency, flat fee, retainer, electronic task-based (Taskbill required), threshold, and progress billing. When clients pay for multiple statements or matters with one check, you can easily allocate the payment across all of the statements and timekeepers with one payment entry. Add your law firm’s logo, customize terminology, and use client-specific notes to make sure statements look the way you want them to. 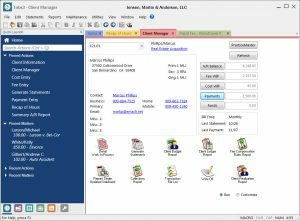 Print bills for all clients at one time, or select groups of clients based on primary attorney, matter type, client status (Progress Billing, Task Based, Bill on Demand, etc. ), and more. Send bills to clients in seconds by using the Tabs3 Email Statements feature. Set up an email template that automatically adds client information to the body of your emails. Tabs3 will automatically attach a PDF statement to each client’s email so you can send batches of statements in just a few minutes. 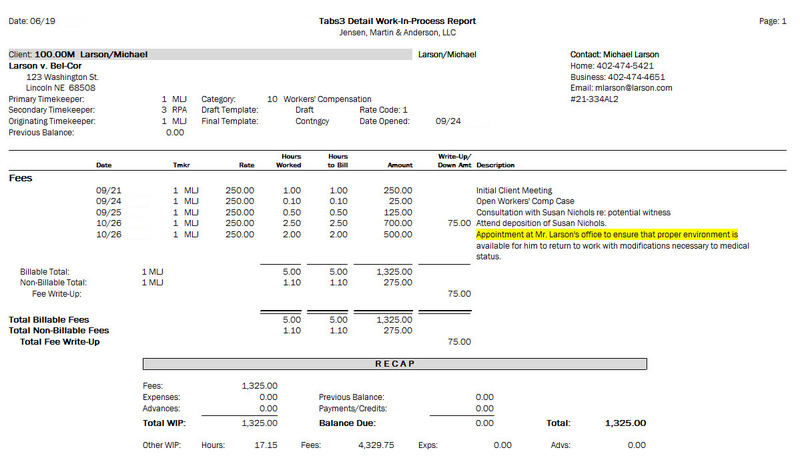 Review unbilled time and expenses by attorney or matter using transaction reports and/or draft statements. From the preview mode, click on individual transactions to drill down and edit them. 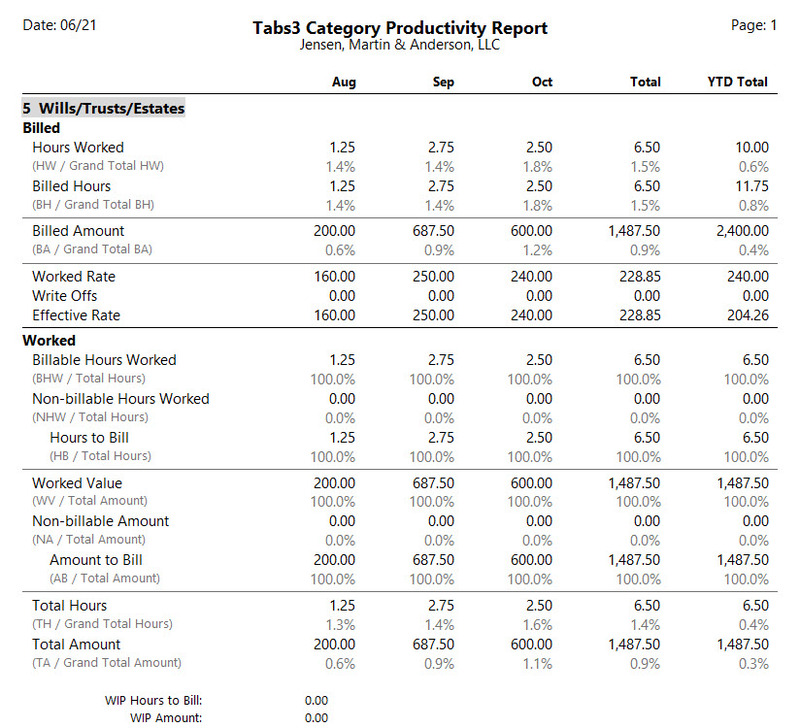 Use Pre-Bill Tracking to track the status of individual bills and the work you have in process. See which statements have been reviewed and are ready to be sent, and which statements are on hold. Create electronic task-based bills in LEDES, LitigationAdvisor, and over 100 other formats and subformats. 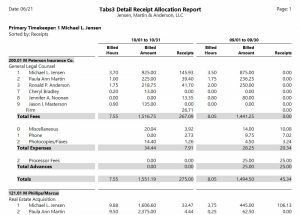 Tabs3 Taskbill Software is required and sold separately. By using Tabs3 to accept credit cards, you enter the payment in only one place. By accepting credit cards, you get paid faster while shifting collection risk to the credit card companies. There’s even a chance someone will make a payment on their way out of your office! Include a ProPay payment link with your emailed statements allowing clients to pay their bill online. Learn more here. Quickly see your most important clients. Rank your clients by work-in-process, billed amounts, write offs, paid amounts and more, for any time period, with the Top Client Report. 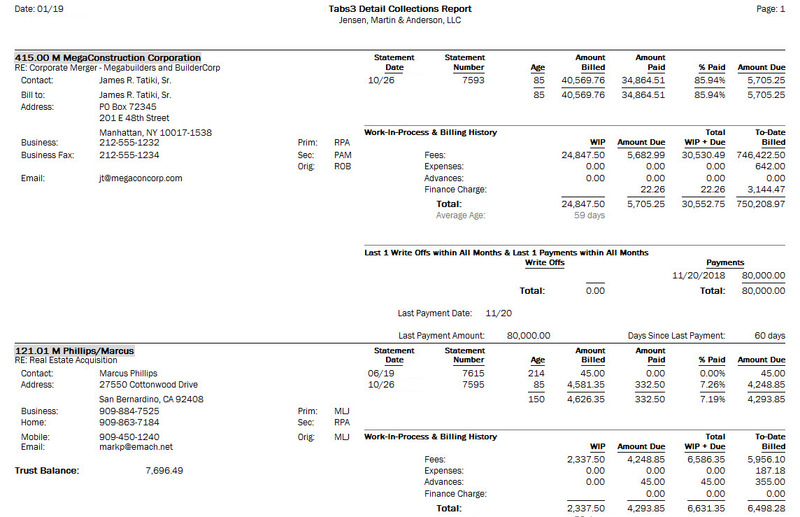 Find your highest-priority accounts receivable clients with the Collections Report. Review amounts billed, payment histories, outstanding invoices, and client contact information for easy follow-up. 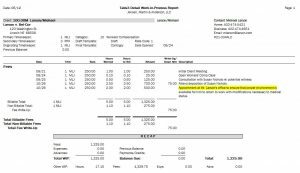 Unbilled transactions are a click away with Work-in-Process Reports. Sort unbilled transactions by client, timekeeper, date, and more to make it easy to find the information you need. 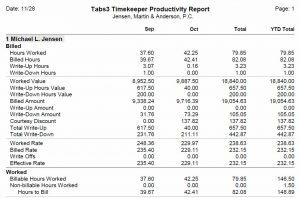 Summarize your daily, weekly, and monthly worked hours with the Recap of Hours Report. This report is particularly useful for identifying hours of work that have not yet been entered. 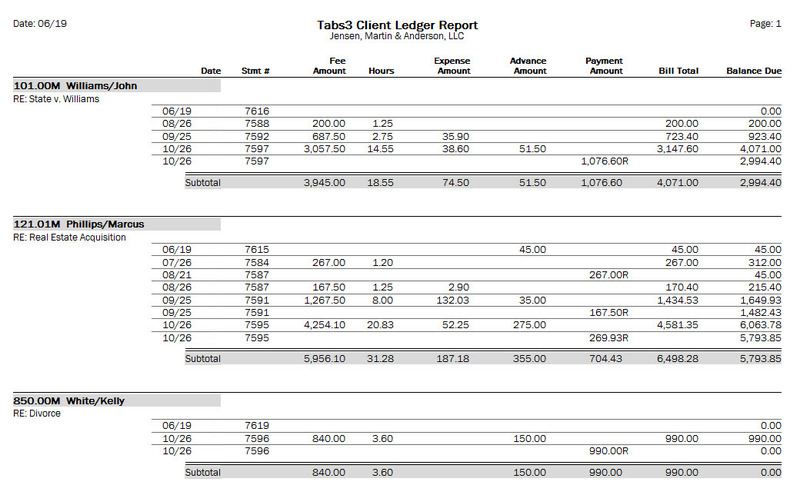 A Client Ledger Report displays a complete history and status of all billing statements. 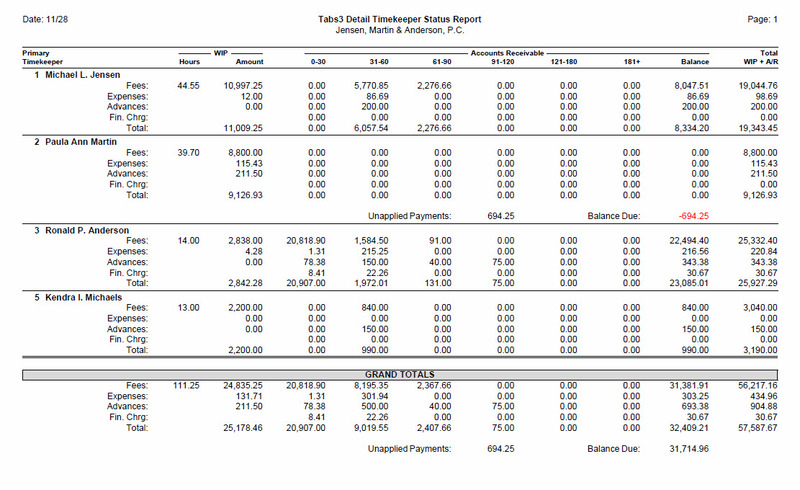 See what has already been paid and what is currently due. 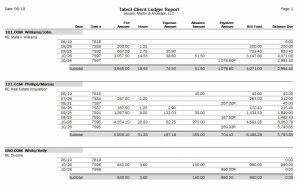 Review amounts billed to each client and amounts currently due. 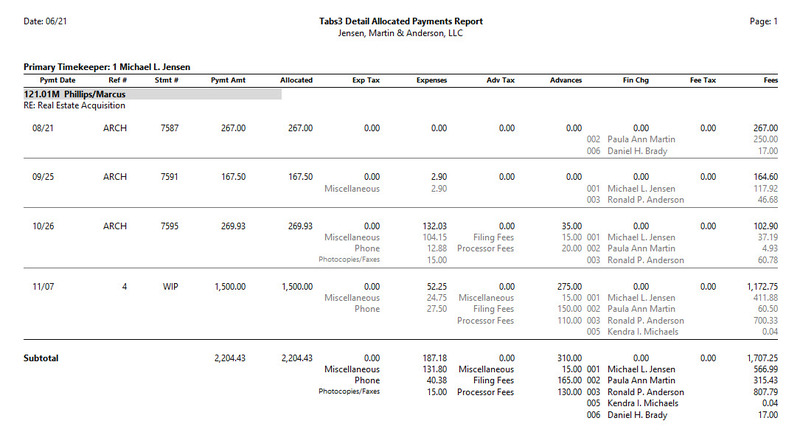 See a summary or detailed report of amounts due by attorney or by invoice. Bruce gets 5% of receipts from work done by Kari, Deb and Phil. Dan gets 5% of receipts for ACME Insurance until June 2015. Brad gets 10% of receipts for Widgets International until he receives a total of $10,000. 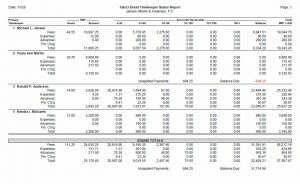 Use the Allocated Payments Report to see how payments were distributed to fees, expenses, advances, sales tax, and finance charge by allocation date. See all of your payments for any date range broken down by fees, finance charge, expenses, and advances. Review all payments that haven’t yet been allocated to a particular invoice. 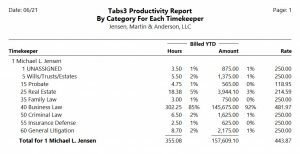 To determine which clients or matter types are most profitable for your firm, run the Client Productivity Report. You will see how much your firm profits from a single matter or area of practice and how that compares with prior years. 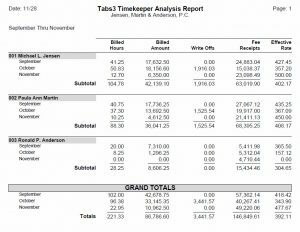 Review billed amounts and overhead for each timekeeper. 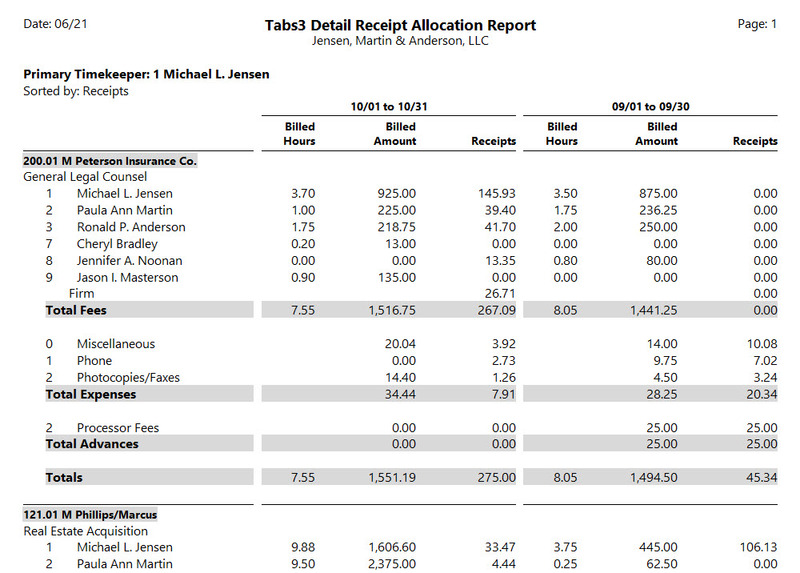 Track how payment amounts were distributed with the Receipt Allocation Report. 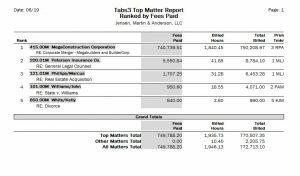 Quickly review payments to see what each attorney received, and how much of the payments were for advances, expenses, sales tax, and finance charges. 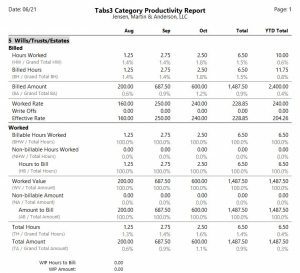 Billings, rates, write-ups, and write-downs are organized by area of practice in the Category Productivity Report. 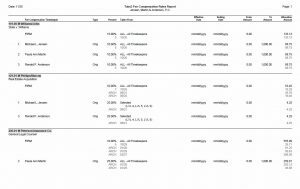 A list of all billed and unbilled task-based billing transactions are available in the Task Code Billing Report. Billed and unbilled amounts for expenses and activities are broken down by common tasks such as phone calls, meetings, research, etc. in the Task Code Budget Report. 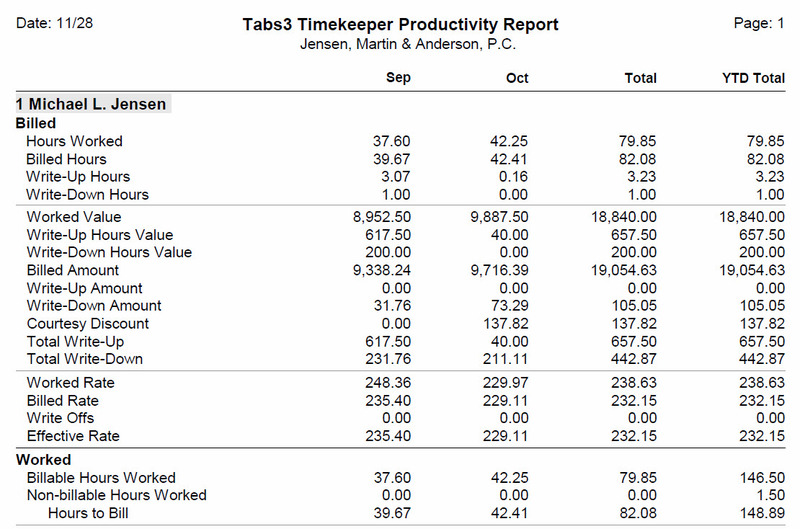 The Timekeeper Productivity Report summarizes billed hours and amounts by specific timekeepers. 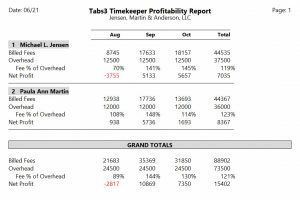 It shows you effective billing rates, write-ups and write-downs, as well as total billable and non-billable hours and amounts for each timekeeper. 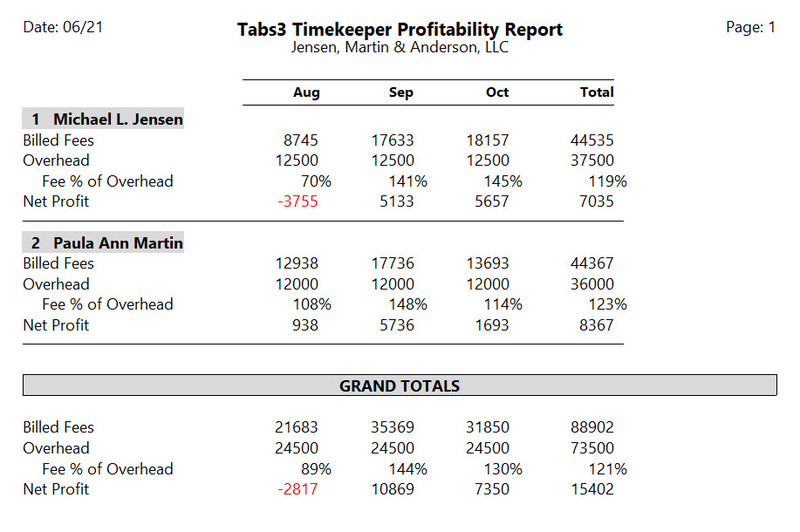 See which staff members handle certain case types most efficiently by running the Category Report by Timekeeper. 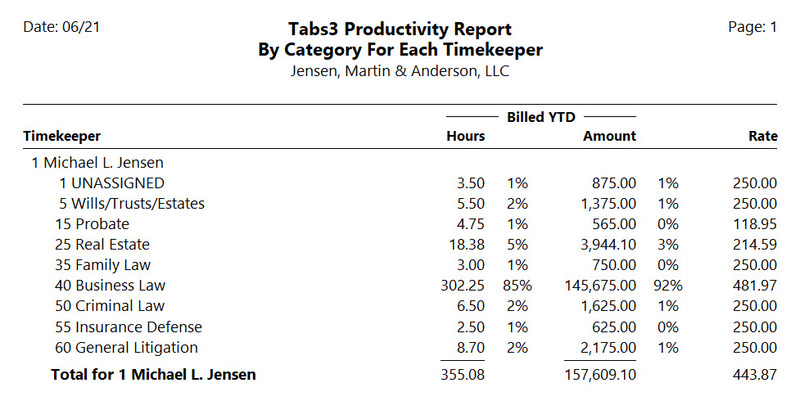 This report shows the hours and amounts for fees billed year-to-date by area of practice for each timekeeper. 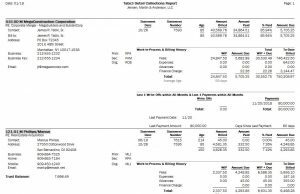 Get a quick overview of all work-in-process and accounts receivable for each timekeeper whether they are the primary, secondary, or originating timekeeper. 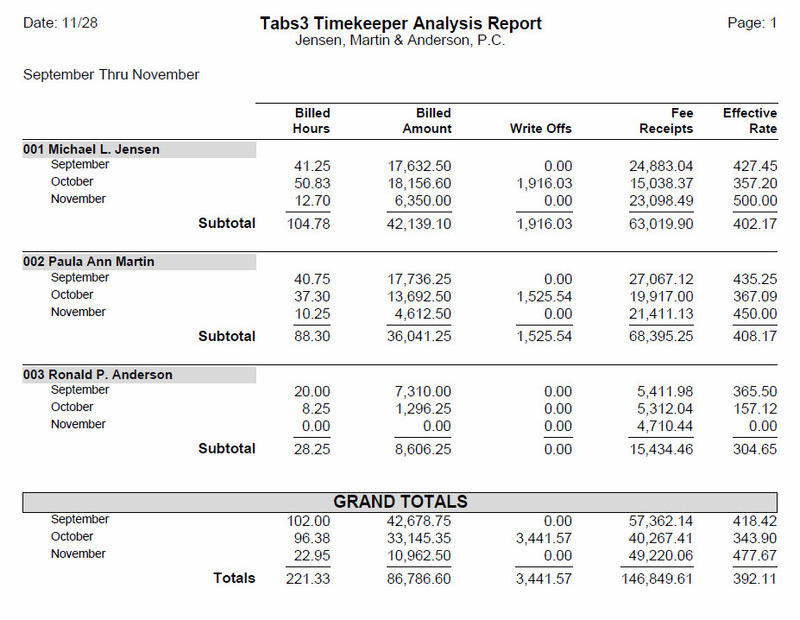 See what has been billed and paid by each timekeeper. You can see billed hours, original hours, billed amounts, and gross receipts.